Not only is India's air pollution hurting the environment, it's killing the country's citizens. Seriously. A report published last week found that the polluted air in India will cut 660 million peoples' lives short by about three years. Cutting back on the use of fossil fuels might cost India economically, but right now it's cutting back on the national lifespan. The study by researchers from the University of Chicago, Yale, and Harvard estimates that 99.5 percent of Indian's 1.2 billion population live in areas with pollution levels above what the World Health Organization (WHO) considers safe. 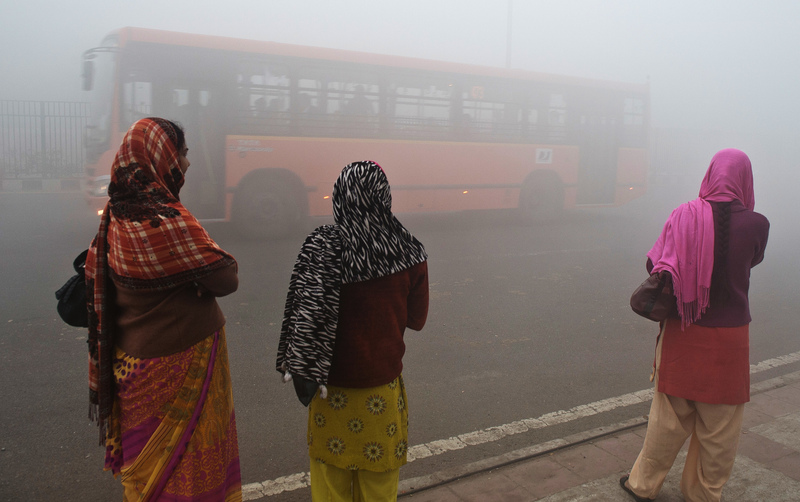 Although the extremity varies by region, nearly every Indian is breathing contaminated air. The researchers say that the 660 million people living in areas with pollution levels above India's air quality standards (less strict that WHO's) would gain an average of 3.2 years of life if the air were improved. A WHO study last year ranked 13 Indian cities in the top 20 most polluted cities in the world, with New Delhi taking the prize for the world's dirtiest air. Despite India's staggering pollution levels, India's power minister, Piyush Goyal, promised to double the country's use of domestic coal to more than a billion tons by 2019. You don't have to be a scientist to recognize that this is a step in the wrong direction. However, for too long, the conventional definition of growth has ignored the health consequences of air pollution. This study demonstrates that air pollution retards growth by causing people to die prematurely. Other studies have also shown that air pollution reduces productivity at work, increases the incidence of sick days, and raises health care expenses that could be devoted to other goods. "Is cleaner air incompatible with India’s urgent need for economic growth?" the study asks. "No." People with longer lives would be able to contribute to India's economy for longer and be more productive due to less illnesses. The study suggests that India implement civil penalties, rather than criminal, with a "polluter pays" system that would encourage companies to reduce their pollution levels. The authors say that India's current environmental policies are too difficult to enforce because they lead to imprisonment or industry closure. However, the first step is to improve pollution monitoring so that the nation can better track the problem. If lengthening its citizens' lives isn't enough to convince the Indian government to decrease its pollution levels, it's unclear what will. People deserve to breath clean air and live in healthy environments. Along with saving the environment, India needs to commit to saving its people.